William Formby Halsall (born 1841 - November 7 1919) was a marine painter born in Kirkdale, England. He lived at Provincetown, Massachusetts and died as a US citizen. Halsall was educated in Boston, Massachusetts and worked as a sailor for seven years from 1852 to 1859. In 1860, he had begun to study fresco painting but due to the outbreak of the American Civil War, he enlisted in the United States Navy. He resumed his fresco study after two years of service. 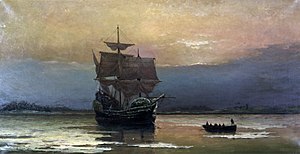 In 1862, Halsall changed to marine painting and studied at the Lowell Institute in Boston until 1870. Halsall was also a founding member of the Provincetown Art Association in 1914.